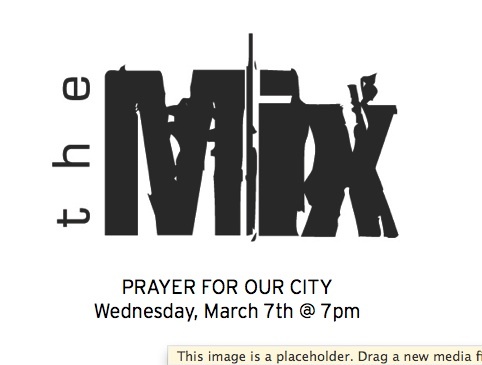 THE MIX: Pray for Your City | BRING. CHANGE. SHARE. Unable to join us for the Spring Break Mission Trip? You can still play a part! Come join us tomorrow night for a unique prayer experience as we pray for our city and the projects that lie ahead of us. See you tomorrow night in the Chapel @ 7pm… come hungry! ← REGISTRATION FOR SUMMER EVENTS!